We’re eating baked rigatoni in a turkey bolognese covered with melted Havarti and mozzarella then garnished with fresh basil. I really can’t say enough about the difference that using good canned tomatoes vs. cheap acidy canned tomatoes makes in pretty much any dish. If you can find them, spend the extra dollar and get the San Marzanos. Also, as another side note, heavily salting your pasta water truly makes the difference between bland and flavorful pasta. Aim for nearly sea water levels and you’ll have delicious pasta every time. Preheat oven to 450 degrees. Spray an 8"x11.5" glass or ceramic baking dish with cooking spray. Set aside. Place a large pot of water over high heat. Add a large handful of salt. Bring to a boil. Place a large saute pan over high heat. Add 1 tbsp canola oil. Once the oil is almost smoking hot, add the ground turkey to the pan. Sprinkle the turkey 1 tsp kosher salt and 1/2 tsp freshly cracked black pepper. Using a wooden spoon or spatula, break up the turkey. Allow the turkey to brown, stirring occasionally, until cooked through. Remove browned turkey from pan, drain and set aside. Return saute pan to medium heat. Add 1 tbsp canola oil to the saute pan. Add the cremini mushrooms, onions and carrots to the pan. Saute the veggies over medium heat, stirring occasionally, for 10-15 minutes until the onions are translucent and the carrots are soft. Add the garlic to the pan and saute for another 1 minute. Add the dried basil and oregano. Saute for 1 more minute. Using your hands, individually crush the whole tomatoes into pan. Be careful of squirting juice! Once all the tomatoes have been crushed, add the rest of the juice left in the can as well as the browned turkey back into the pan. Stir. Bring sauce to a simmer. Simmer sauce over medium heat until nearly all of the liquid from the tomatoes has cooked away, about 30-40 minutes stirring occasionally. Once liquid has cooked away, taste and adjust seasonings as desired with kosher salt and freshly cracked black pepper. After about 20 minutes of simmering the sauce, boil the pasta according to the directions on the package. Drain. Add the cooked pasta, diced zucchini and basil to the finished sauce. Stir thoroughly to evenly coat. Pour the pasta and sauce into the prepared baking dish. Sprinkle mozzarella and Havarti evenly over the top of the pasta. Place into a preheated 450 degree oven. Bake until the cheese is melted and golden in areas, about 15-20 minutes. Remove from oven and let cool for at least 5 minutes before serving. Garnish with fresh basil if desired. Enjoy! I’m a big fan of baked rigatoni, but I have to say that I’m not fond of Havarti, so this recipe wouldn’t be for me. 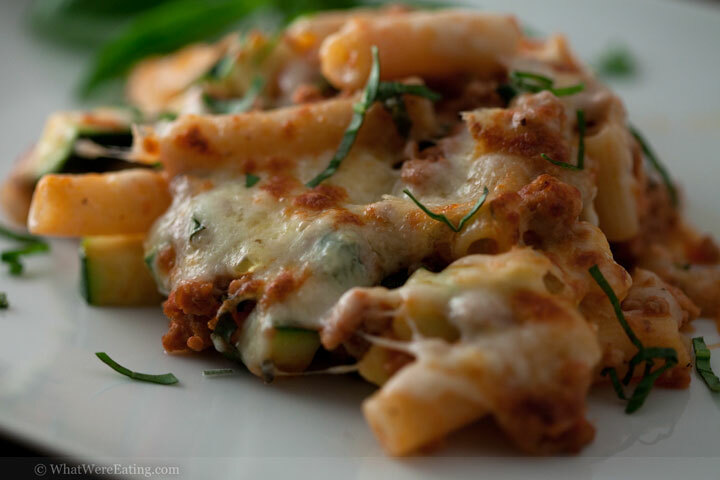 I do, however, think that I’m going to have to get out the recipe for my own version of baked rigatoni and add the ingredients to my next grocery list because this post has made me hungry for that dish. Looks like a great recipe. Thanks! I’ll have to give it a try. I have been doing most of my cooking outdoors now that its summer. I have gotten so much better with different recipes and grilling methods thanks to the Weber website. Check it out sometime for some great tips. (http://weber.com/recipes/Recipe.aspx?rid=62). BTWâ?¦ check out our new video series â? ?Weber Grill Masterâ??. http://www.youtube.com/watch?v=iRN-VTuA0aw Grilling experts Jamie Purviance and Steven Raichlen compare notes on grilling techniques, what inspired these classically trained chefs to pursue the art of cooking with live fire, and find out what led to their biggest grilling mistakes. Mmmm, looks melty and delicious! I like that you used so many veggies in the sauce, since I’d be doing a meatless version. Thanks for sharing!